I stood at the bathroom sink and pulled rollers from my hair. Granny appeared at the open door and caught me by surprise. She had helped Mom prepare the dinner for my wedding reception, and should’ve been relaxing. Of the Holiness Pentecostal faith, Granny believed a woman’s hair is her glory, never to be shorn. Yet, she stood silent as I backcombed my personalized Sasoon. I turned and smiled in effort to read her mind. Like my mother, you couldn’t pry a word out of Granny if she didn’t want you to. When I leaned close to the mirror and applied my eyeliner, she didn’t lecture me about wearing makeup. Rather, her stoic, large figure relieved my anxiety about Dad walking me down the aisle. He wouldn’t cause trouble with Granny sitting next to Mom in the pew. As I zipped my makeup bag, my childhood summer sentinel balanced her tender and tough love for an immature, oblivious twenty-one-year-old on the brink of matrimony. 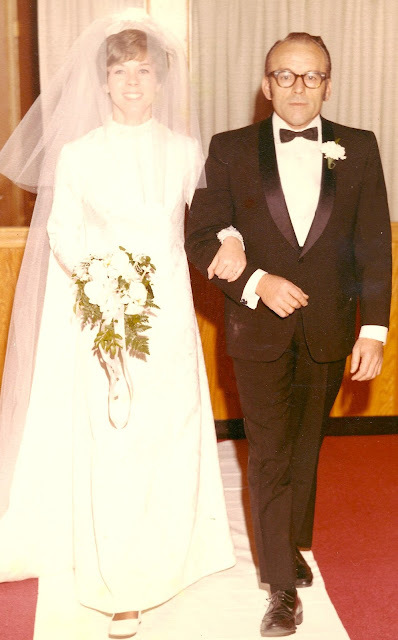 Today, on my forty-eighth wedding anniversary, I wonder again whom and what persuaded Granny to leave the comfort of her home in Kentucky and walk into the fallout of my parents’ divorce. What force granted my grandmother the will to travel five hundred miles to Michigan and stitch white brocade over Dad’s military Bible as a base for my bridal bouquet? I like to think Granny considered that happy summer I was nine-years-old and spent three days alone with her and Poppy Roy. She cut patterns from newspaper and sewed me two matching skirts and blouses, a yellow and blue set. I chose the blue floral print when Poppy drove us to Portsmouth, Ohio, to visit relatives I’d never met. Poppy bought us an ice cream cone on our way home. 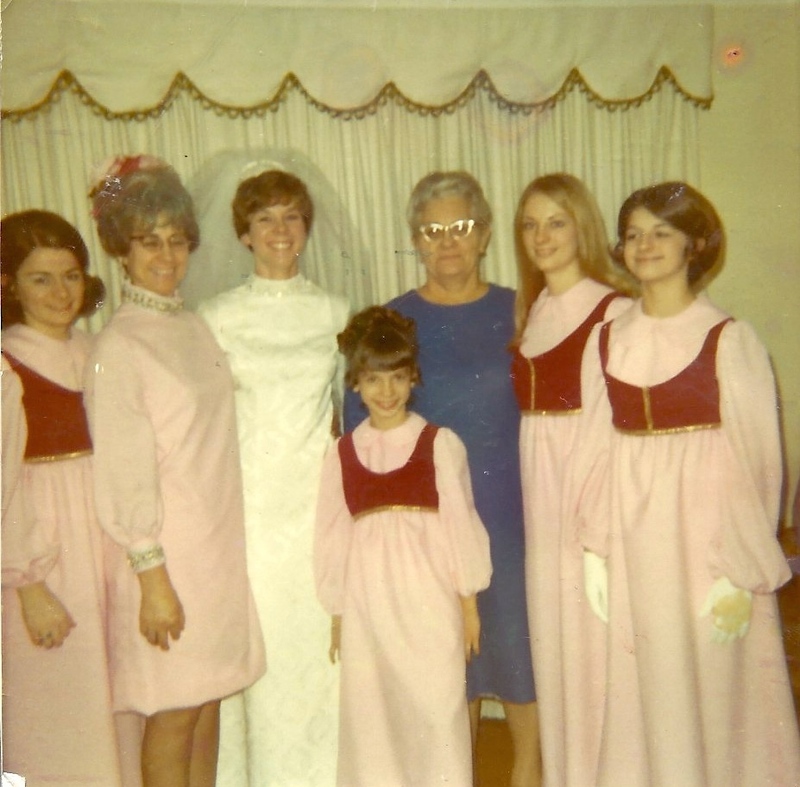 Or, on that cold January 24th in 1970, did Granny ponder her wedding day? Ollie Jane Hunt boasted eighteen years when she married James Floyd McCoy, an itinerant teacher of thirty-nine. She bore him eight children in ten years. My mother was the eldest of five who survived to live well into their eighties. Granny was sixty-eight when she enveloped me in her acceptance in those last hours of single womanhood. My mother, forty-eight. I then understood why Mom sat alone in her pew at Redeemer Baptist Church. My heart broke for her. My father behaved like a gentleman as we followed my sisters and groomsmen down the aisle—my mother a gracious lady. Dear Reader, it must've taken severe grace for Granny to hold her tongue in those holy moments by my side. And I’ve forgiven myself for failing to wrap my arms around her with a kiss. Most likely, if I knew my grandmother's love, buried beneath her convictions, that’s truly what was on her mind.